Titles include: The Coffin Dancer, The Empty Chair, and The Stone Monkey. NYPD criminalist Lincoln Rhyme joins his beautiful protégé, Amelia Sachs, in the hunt for the Coffin Dancer -- an ingenious killer who changes appearance even faster than he adds to his trail of victims. Rhyme must rely on his wits and intuition to track the elusive murderer through New York City -- knowing they have only forty-eight hours before the Coffin Dancer strikes again. Renowned criminalist Lincoln Rhyme faces his ultimate opponent: a kidnapper and murderer dubbed the Insect Boy. But Rhyme is in for a surprise when he learns that catching a criminal is one thing...and keeping him is another. 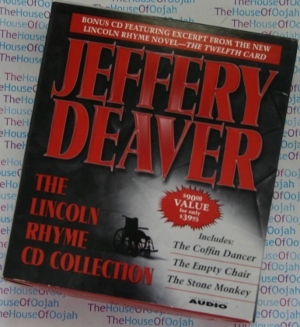 A former journalist, folk singer and attorney, Jeffery Deaver is an international number-one bestselling author. His novels have appeared on a number of bestseller lists around the world, including The New York Times, The Times of London and The Los Angeles Times. His books are sold in 150 countries and translated into 25 languages. The author of twenty-five novels and two collections of short stories, he's been awarded the Steel Dagger and Short Story Dagger from the British Crime Writers' Association, is a three-time recipient of the Ellery Queen Reader's Award for Best Short Story of the Year and is a winner of the British Thumping Good Read Award. The Bodies Left Behindwon the "Best Thriller Of The Year" award from the International Thriller Writers Organization in 2009. His thriller The Cold Moon won a Grand prix from the Japanese Adventure Fiction Association and was named Book of the Year by the Mystery Writers Association of Japan. He's been nominated for six Edgar Awards from the Mystery Writers of America, an Anthony Award and a Gumshoe Award. He was shortlisted for the ITV3 Crime Thriller Award for Best International Author. Jeff won a "Lovey Readers Award" for best series of 2008, for the Lincoln Rhyme series, at the Love Is Murder writers' conference.